One thing I have been doing is playing games. The rest of this post will be about them so it’s likely to be of no interest to anyone but me 🙂 I’ve introduced Sammie to World of Warcraft (I’m sure it won’t be long until she’s better than I am) and recruit a friend makes levelling fast. I’ve not played as much with her as I’d have liked but hopefully we’ll get more time now I’m doing better. When I’ve been on when Sammie’s not I’ve been doing a bit of work on the legendary ring quest chain. I got my third elemental tablet thing so my ring is now item level 715. The next step is to get Blackhand’s arm which is kinda disgusting but at least it’s not going through poop. I’m hoping to work on getting Pepe soon and pet battles. I’ve been playing a lot of Neko Atsume and recently got every single memento in the game. I already had every goodie so now I’m slowly working towards getting every theme and hoping they release new content. The cats are so adorable though so I’m really happy to play it. In High School Story I’ve managed to complete all the current story lines, which I wasn’t expecting to do yet. I’ve got 15 classmate rares still to get (I’ve got the common gender of each type already), but I’m in no rush. I’m current working on getting a female hacker. I was frustrated that some of the goals seemed nearly impossible but they have been a bit easier recently so I’m happy there. Hollywood U has been a bit more frustrating on the goal front, not least because they often don’t show up when they’re meant to so I end up getting less time (I missed nearly a day for this week’s). I’ve completed all the quests so I’m just working on the goals and getting both Critics, as they’re the new type and I’ve not managed to get either yet. It’s only been a few days though. I’m still playing Kim Kardashian Hollywood, though I’ve come close to quitting a few times. The issues I was having seem to have been fixed, and though it’s still buggy it’s playable now. I’m level 39, number 1 on the A+++ list, and have mostly completed the quests, other than the most recently released ones. I try not to worry about the weekend events, so unless there’s something I really want as a prize I just do them as and when. During the week I also work on levelling the VIPs through Hangouts and jobs, though I’ve only ever got the special reward once. At least it doesn’t require much concentration. A new game I’ve been playing recently after being invited by a friend is Happy Street. I’m still not entirely sure what I’m doing, but it’s cute (if a bit obsessed with poop) and I seem to always have something to do so I’m keeping it for now. One game I tried and then gave up on with Kendall and Kylie. That game is so slow I can read a chapter of a book in the time it takes to load (anything from 3 1/2 to 7 minutes). For a mobile game it’s terrible. Not only that, but since update 1.1.0 the game doesn’t seem to save correctly, so any progress is lost. More recent updates don’t seem to have fixed it. Luckily I’d already reached level 8 for the crossover stuff in Kim Kardashian Hollywood, but until they do some major work I won’t be playing any more of it. It’s a shame as I quite enjoyed the storyline. Other games I’ve got installed on my tablet right now are AdVenture Capitalist, 80 Days, The Room 3 and a couple of different Sudoku games. I’m currently waiting for AdVenture Capitalist to be completable sometime this millennia (no joke), 80 Days I got annoyed with as I missed a couple of connections due to brain fog so I’m taking a short break before trying it again, and the Room 3 I’m playing in bits as it requires quite a bit of cognitive energy. The sudoku games are fun for me and a way of judging how I’m doing mentally- the logic required is normally very easy for me, so if I’m struggling to complete an expert puzzle or easy killer sudoku I know I’m not doing great. If I can’t solve one of the easier ones then I know I need to rest. The last game I have is Hearthstone. For a while it was unplayable on my tablet, but I reset it while installing a newer version of my rom and it’s running better now. I’m mostly playing the Tavern Brawls when I get the chance, as I don’t know the current meta game well enough to work on ranked. Hopefully now I’m getting on my computer a bit more I’ll be able to play some Heroes of the Storm and other games, but with having to do adult stuff like paying bills, sorting money and food shopping when I’m on here as well I’ll have to wait and see if I can manage it more frequently. A quick blog post as I want to blog at least monthly, but this month I’ve not been well even for me. January relapses are normal but this one is lasting longer than I’m used to. I have a cold. I’ve had it now for several weeks, might now be months. I’m sleeping a lot, though my FitBit is telling me that I’m getting a lot less sleep than I realised (will sleep for a 13 hour period but only actually get 8 hours of sleep in that time, as I’m waking up so much due to pain/not being able to breathe/nightmares). I’m very lucky if I manage mood than an hour of uninterrupted sleep a day. I don’t even remember what a sleeping pattern is. I’ve managed to go on my computer twice, which is less than normal for me. There are some things I can only do on my computer so I’m frustrated but pushing myself results in being worse. I spent 15 minutes in my chair at the beginning of the month to have my sheet changed but haven’t been well enough to go back in it. That small amount of extra dizziness, pain and exhaustion makes such a difference in what I can do. Anxiety because the care agency still isn’t doing what I need them to doesn’t help. Good news is Johan almost has a passport. He went for the interview on his birthday and it went well so he’s just waiting for it to arrive. It’s awesome seeing him so excited. He’s planning on going to Sweden in the summer to play games very fast and see friends who also like playing games very fast. When my body has been behaving enough I’ve been eating the goodies we were given for Christmas. Gingerbread penguins and posh fudge are very nice, and not too bad when they reappear multiple times 😛 I’ve also had McDonalds which I caused me less pain than most other foods, because my body is weird (only the lettuce caused issues). I’ve been so grateful for my friends the last few weeks. 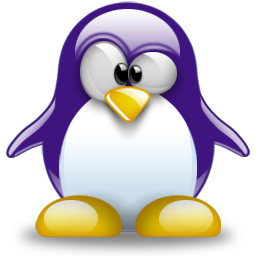 Sending me penguins (especially for Penguin Awareness Day). Giving me (online) Squishes. Being understanding when I disappear from Twitter and Facebook for a bit. My cousin Elka linked me a penguin shirt that had a picture of a penguin made up of lots of little penguins, and I bought that and it arrived yesterday. I can’t wait to be well enough to get changed into it. It’s purple and long sleeved and awesome. I’ve currently got a problem where I can’t sleep at night. Since that’s when other people sleep and most things happen during the day, that’s an issue. I’m hoping that I’ll soon get over the anxiety and paranoia that’s stopping me sleeping then. My setup for making a loom band bracelet. 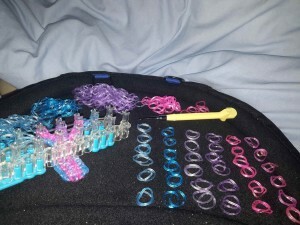 Trabasack with loom, hook and bands sorted (plus spares as I didn’t know if I’d need any more). 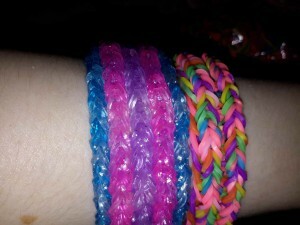 I’ve managed to make two loom band bracelets in the last couple of days, both reversible and based off fishtail patterns. 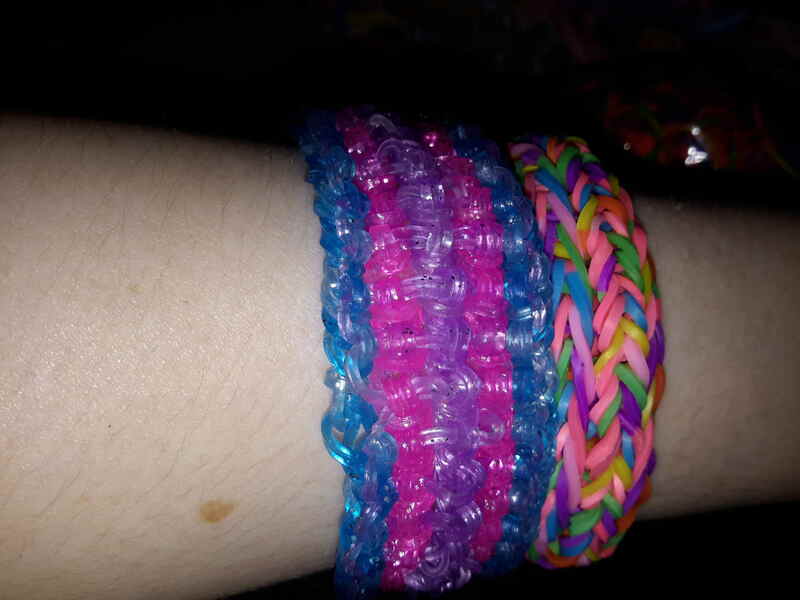 The first is called a reversible slipfish, and I made it with glitter jelly bands from my massive box of loom bands (it has 15,000 bands in that should keep me going for a bit). I first tried it a couple of days ago but made a mistake that was really noticeable and too far down to really repair, and I wasn’t happy with the way the colours had gone so while I couldn’t sleep last night I decided to start again. The design makes my hands sore and crampy quite quickly so I have to take a break every couple of minutes, but I managed to finish it tonight while talking to Sammie. I really like the design and I want to experiment with different ways of creating it to see what happens when I’m more confident. The only problem I really had was the glitter from the bands getting everywhere, so my bed Trabasack and top are now covered in glitter 🙂 The YouTube video tutorial is at https://www.youtube.com/watch?v=qTFCGpmHvEs. The second is called the 5 pin funky fish, and I decided to use multicoloured bands for that one. As I made it using a monster loom it was a lot easier on my hands so I could go longer before needing breaks, and I managed to complete it in a couple of hours. I like how there’s two fishtails on one side and three on the other. The tutorial video is at https://www.youtube.com/watch?v=WBEjpMut7Yw. I’m getting better at making them though I still have an issue with bands twisting and sometimes making mistakes, though that’s also giving me lots of practice in how to go back and fix them. I think I might be able to consider loom knitting as not needing to hold everything up and being able to put it down whenever is what’s making this possible for me, along with only needing to concentrate on what one hand is doing (and I alternate them to try and cope with cramping). One side of the reversible bracelets. The SlipFish is on the left, the 5 Pin Funky Fish is on the right. The other side of the reversible bracelets. I’m hoping tomorrow to maybe be able to go out, or at least get into my chair. I’m also going to try really hard to be awake for the evening carer as I need my hair washing desperately. The next time I get into Gateshead or Newcastle when places are open I’m hoping to go to a barbers to get all my hair shaved off, but until then I’ll just need to figure out what to do with it. I’m also looking for dystopian young adult fiction where romance isn’t one of the central themes. This is harder than it should be. Why does it always have to involve love interests, and often a love triangle? There’s more important things to be doing! Silly books. I noticed as a kid that most pop songs were about love or romance in some way, and didn’t like it. Even now I get irritated by many songs are like that. Come up with other topics please?